Un edificio de siete pisos de vivienda accesible para adultos mayores remplazará al actual centro administrativo de la Diócesis de Tucsón en 111 S. Church Avenue. Las oficinas actuales se trasladarán a un nuevo edificio. El complejo diocesano de cuatro pisos remplazará al actual Cathedral Hall en la Plaza de la Catedral. The old Marist College will have eight senior housing units and a community center. The building is on West Ochoa Street. This 2012 file photo shows the Marist College, which has been in disrepair for more than a decade. A new proposal seeks federal help to turn the building into senior housing and a community center. A four-story center for offices and events will replace the current Cathedral Hall at the Roman Catholic Diocese of Tucson’s Cathedral Square, as part of a restoration project that would cost between $40 million and $45 million. The Phoenix-based Foundation for Senior Living will contribute about $22 million to turn Marist College and the Bishop Manuel D. Moreno Pastoral Center into a community center and affordable housing for seniors — if the foundation receives federal low-income housing tax credits in June, said Bishop Gerald Kicanas at a news conference Friday. The diocese has tried before to secure public money to save Marist College, though unsuccessfully, because St. Augustine Cathedral has not wanted to relinquish ownership of its properties. In this partnership, Marist College is being leased to the Foundation for Senior Living, said Steff Koeneman, the director of communications for the diocese. The diocese anticipates spending about $15 million to build the four-story Diocesan Complex, restore the rectory and Our Lady’s Chapel, make improvements to Ochoa Street and possibly add a level of parking above the current lot, said John Shaheen, the director of property and insurance for the diocese. St. Augustine Cathedral is about three stories, not counting the towers. The restoration is part of the diocese’s commitment to stay downtown and fix something “that has been a blight on the city and an embarrassment to the diocese,” Kicanas said. The 50,000-square-foot Diocesan Complex alone will cost about $12 million. It will include offices for the cathedral on the first floor, a 500-seat event and education center on the second and the offices for the diocese on the third and fourth floors. The space is needed. It will replace St. Augustine’s parish hall, a facility not large enough to serve the 800 to 1,000 families in the parish, much less the diocese as a whole, Kicanas said. The diocese offices now at 111 S. Church Ave. will move to the new building as part of the deal to save Marist College. To make the ground-level community center, the Foundation for Senior Living needed a property that would provide additional housing for residents who would use the space. After purchasing the two-story administrative center for $2.5 million from the Catholic Foundation for the Diocese of Tucson, the Foundation for Senior Living will construct a seven-story facility for senior housing there, Kicanas said. That building will have 75 units, and Marist College will hold eight, in addition to the community center. 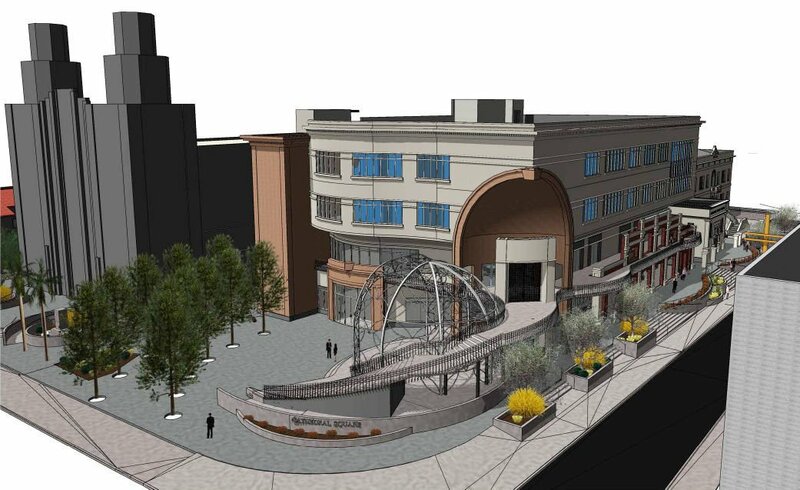 Both will be called The Marist at Cathedral Square. Of the $22 million sum the foundation is putting toward the project, about $19.6 million comes from federal tax credits, said Steve Hastings, the director of real estate services for the foundation. If that money comes through this summer, construction would begin in January 2017, Kicanas said. Already, the diocese has begun work on Our Lady’s Chapel, which has been used lately as storage. To fund its part of the restoration, the diocese is relying on major donors instead of a capital campaign. So far, it has raised $4.6 million, according to Ernie Nedder, executive director of the Catholic Foundation. Part of the sale of the pastoral center may go toward restoration, as well. Kicanas added the diocese is debt-free now and may also take out a $3 million loan. Both the diocese and the Foundation for Senior Living are working with the city to make Ochoa Street more pedestrian-friendly. The foundation will receive $192,000 from the city of Tucson for that purpose, along with the waiver of about $300,000 in fees, Hastings said. Part of that project includes creating an entrance on the street for Our Lady’s Chapel, removing parking meters and taking down part of the wall enclosing Cathedral Square. La Placita Village just one of many ideas for more downtown living. Tibetan group creates website to list all organizations in Tucson. Northwest side of town to get another infill housing community. Two priests died within days of each other. At age 75, he'll have no other choice. Usually the pope accepts. Diocese plans to save one historic building and demolish another. He has served in Tucson for about 15 years. A roundup of what's going on in Tucson's faith community. Old parish hall was consumed by flames in 2014.